Welcome to a detailed look at the current range of Evil Bikes for the 2018 season. If you’re trying to decide between models, we are here to dive into the details to reveal what Evil Bike will be best suit your riding style. 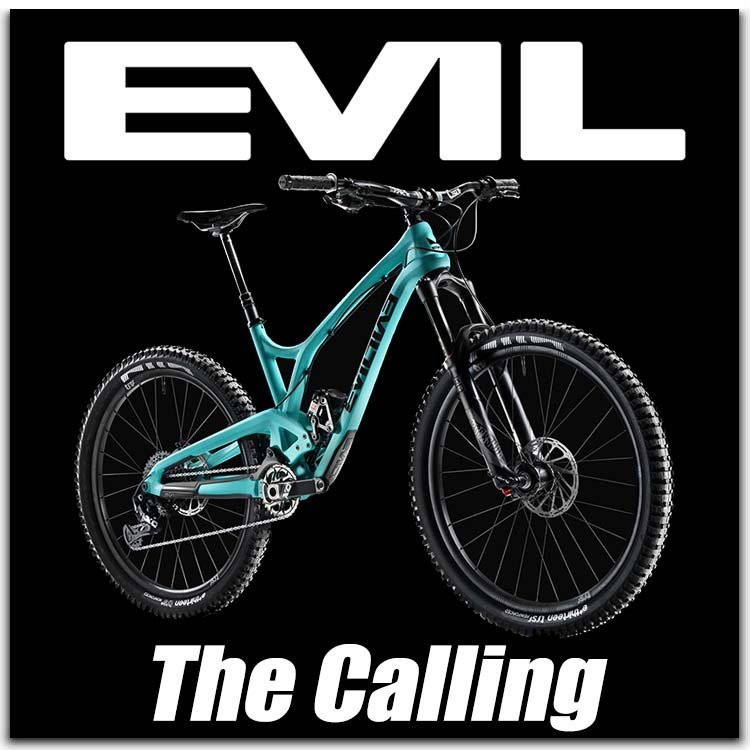 The straight forward options with the Evil range mean that you’re certain to find the right bike, whether that will be a hard-charging 27.5 or a 29” monster truck that shuttles you to the top and shakes the forest on the way down. While each model has its own series of features and a unique personality, some features are carried right across the range such as the super-light carbon frame with it's DELTA suspension system and the Flip Chip adjustment. Tune-ability and personalised feel is what the Delta Suspension System is all about. Ultimately, the system works to achieve a high degree of suppleness early in the travel with a very high traction stage throughout the mid-stroke and a bottomless ramp at the end of the travel. Mechanically, the system uses a series of compact linkages to achieve a high range of angle and velocity changes throughout the suspension travel. Customise your ride! The flip chip allows the rider to change the head angle and the bottom bracket height by flipping the chip. This keeps the leverage rate and the orientation of the linkage the same but due to a slight offset in bearing bore, allows the rider to personalise their ride according to the way they ride and the terrain. 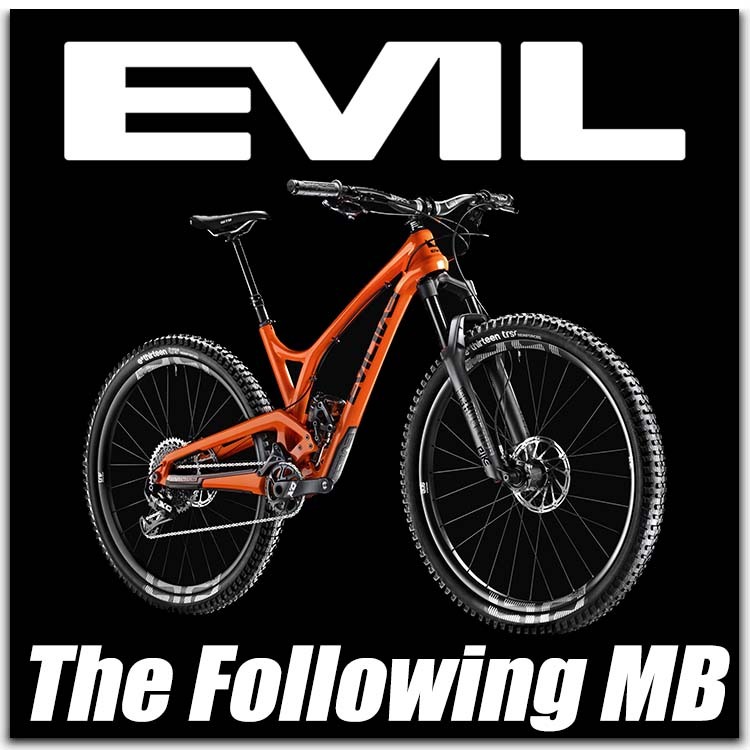 So when you first look at the range it's easy to get lost in understanding what the key differences are between the latest Evil mountain bikes. That's why we've put together a couple of infographics. Firstly, the correlation between wheel size and front suspension travel. 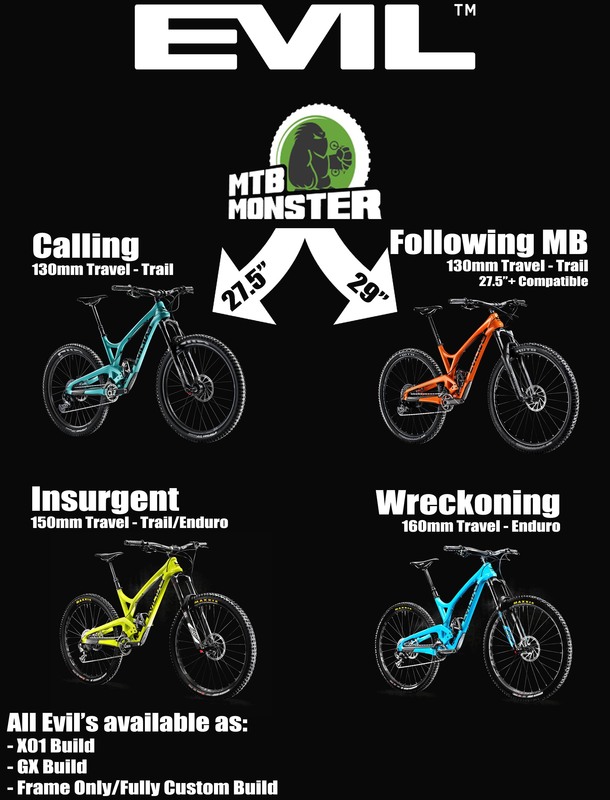 This is followed by another infographic to show which bike is best suited to your riding, whether that be the calling, the following, the insurgent or the evil wreckoning. 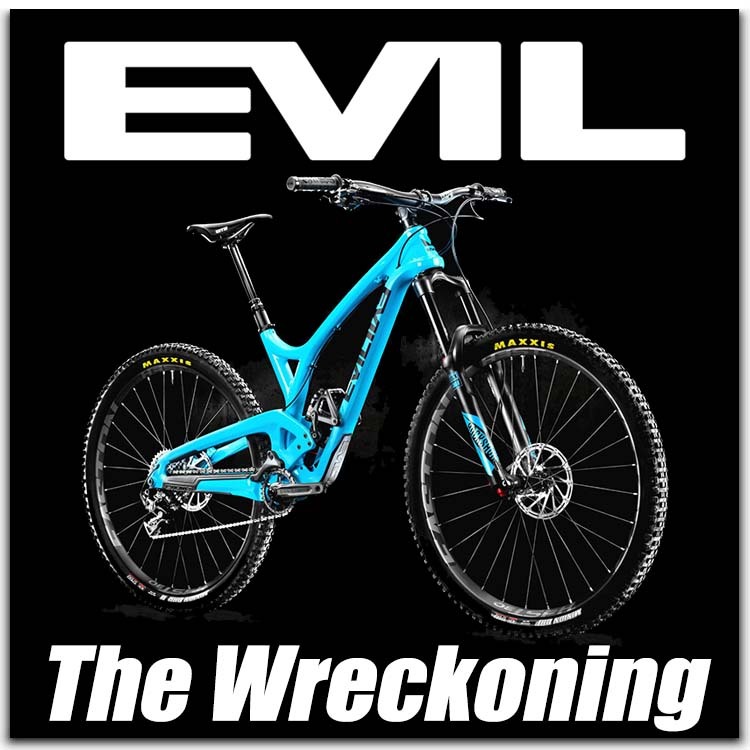 Evil Bikes: Differences in wheel size & front suspension. 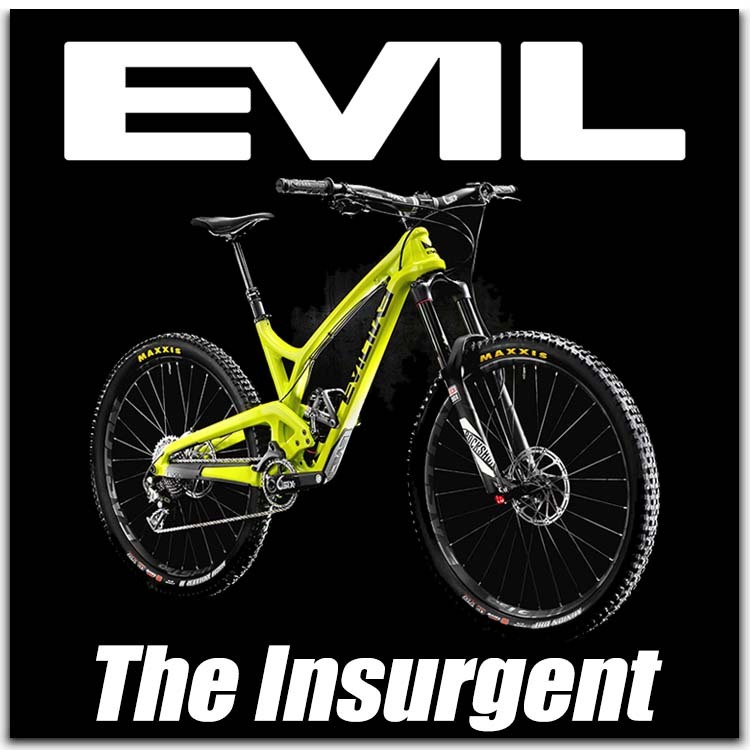 Which Evil Bike is best for me? 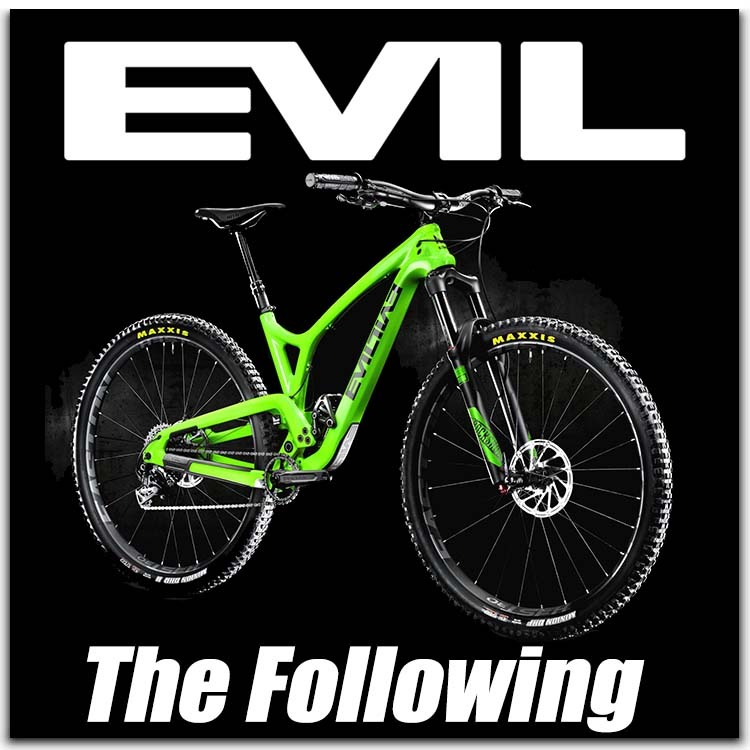 Hopefully, after a brief overview of the key technologies and features throughout the Evil cycles range you'll have an idea which model will best suit your riding. The next step is the take a look at the models below and decide which spec will work best for you. Within the Range, there is the option to choose just a frame. This allows you to build up your own frame or alternatively you can contact us to build your dream evil custom build. While you can view the full range of Evil models, you can also view the individual models by selecting from the icons below.